Over 20 bands on 3 stages! Comedians, Poets, Artists, Vendors, Political Activist Guest Speakers & so much more! 5501 NE 2nd Ave, Miami, FL. 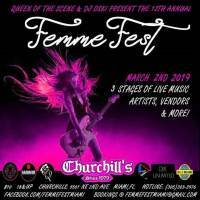 This years Femmefest will feature 20+ bands and artists of all styles of music, poetry, comedy and guest speakers on 3 stages. It will also include vendors, artists and even a pamper room (massages, nails, make up, fashion). In numerology, the number 12 is one of Love, Light & Positive Energy. The number 12 represents optimism, creativity & self expression. All of these are exactly how I envisioned FemmeFest to represent when it started 12 years ago. March is National Women's History Month. Strength has no gender and Femmefest packs a powerful punch, proving that you cannot underestimate a woman's role in society whether in business or music. 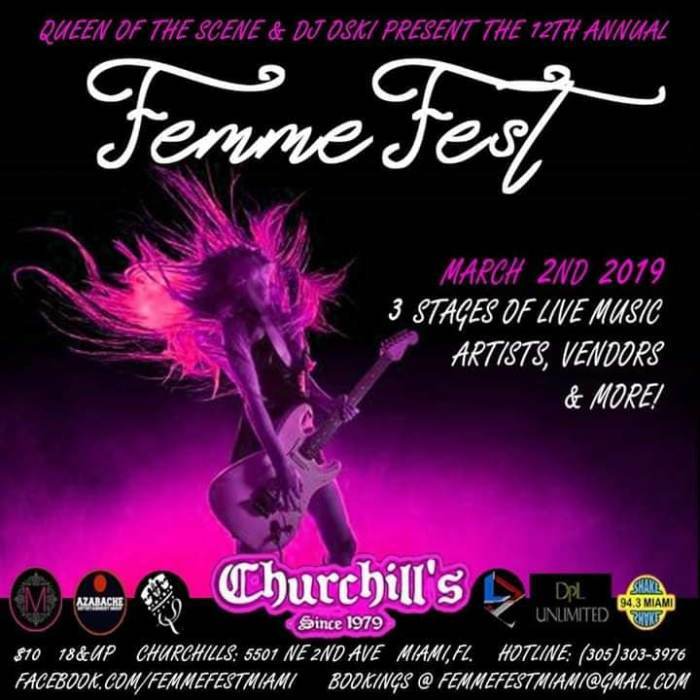 So come hear her ROAR on March 2nd 2019 at Churchills Pub in Miami.